Racial and ethnic disparities weaken the credibility of a justice system that purports to treat everyone equitably. Across the country, juvenile justice systems are marked by disparate racial outcomes at every stage of the process, starting with more frequent arrests for youth of color and ending with more frequent secure placement. The landmark 1988 report to Congress, A Delicate Balance,1)Coalition for Juvenile Justice (1988). A Delicate Balance. Washington, DC: Coalition for Juvenile Justice. highlighted concerns regarding disparate confinement (those juveniles confined either pre- or post-adjudication), and led to an amendment to the Juvenile Justice and Delinquency Prevention Act (JJDPA) of 1974 to track those differences through the Disproportionate Minority Confinement (DMC) core requirement. Later amendments, passed in 2002, expanded the concept of DMC, seeking to measure disproportionate contact beyond the point of confinement.2)Coleman, A. A Disproportionate Minority Contact (DMC) Chronology: 1988 to Date, Washington, DC: Office of Juvenile Justice and Delinquency Prevention. The publicly reported data (required under the JJDPA) only measure the extent of the differences; they do not identify causes. DMC reflects both racial biases woven into the justice system (“differential selection”) and differences in the actual offending patterns among racial and ethnic groups (“differential involvement”). Federal law requires data be collected at multiple points of contact within the juvenile justice system, including arrest, referral to court, diversion, secure detention, petition (i.e., charges filed), delinquent findings (i.e., guilt), probation, confinement in secure correctional facilities, and/or transfer to criminal/adult jurisdiction.3)Coalition for Juvenile Justice (2010). Disproportionate Minority Contact (DMC) Facts and Resources. What is not in dispute is that the differences exist. The extent to which jurisdictions experience racial and ethnic disparities has been exhaustively studied. A 2002 literature review found that two-thirds of studies on minority overrepresentation in the criminal justice system showed negative race effects at one or more steps of the process.4)Pope, C., Lovell, R., & Hsia, H. (2002). Disproportionate Minority Confinement: A Review of the Literature from 1989 through 2001. Washington, DC: Office of Juvenile Justice and Delinquency Prevention. Differences in arrest rates and processing of juvenile offenders are the residue of policies and practices that have disparate impact on communities of color. A litany of studies clarify the reasons DMC exists: selective enforcement, differential opportunities for treatment, institutional racism, indirect effects of socioeconomic factors, differential offending, biased risk assessment instruments, and differential administrative practices.5)Nellis, A. (2011). Policies and Practices That Contribute to Racial and Ethnic Disparity in Juvenile Justice, published in Parsons-Pollard, N. Y. (2011). Disproportionate Minority Contact: Current Issues and Policies. Durham, NC: Carolina Academic Press, pp. 3-4. The U.S. Justice Department’s Office of Juvenile Justice and Delinquency Prevention (OJJDP) reports that disproportionate juvenile minority representation “is evident at nearly all contact points on the juvenile justice system continuum.”6)OJJDP (2012). In Focus: Disproportionate Minority Contact, Washington, DC: Office of Juvenile Justice and Delinquency Prevention. Understanding how contact with the juvenile justice system is disproportionate first requires understanding the racial and ethnic makeup of the juvenile population. In 2010, African Americans comprised 17 percent of all juveniles, but 31 percent of all arrests.7)Puzzanchera, C. and Hockenberry, S. (2013). National Disproportionate Minority Contact Databook. Developed by the National Center for Juvenile Justice for the Office of Juvenile Justice and Delinquency Prevention. Online. This rate is little changed from prior decades. Similar disparities may exist among Latino youth, but data on ethnic disparities are limited. Racial disparities have remained durable even as juvenile crime rates (and other related statistics, such as detentions) have fallen.8)Puzzanchera, C. (2013). Juvenile Arrests 2011. Washington, DC: OJJDP. The discrepancies do not stop with arrests. Among those juveniles who are arrested, black juveniles are more likely to be referred to a juvenile court than are white juveniles. They are more likely to be processed (and less likely to be diverted). Among those adjudicated delinquent, they are more likely to be sent to secure confinement. Among those detained, black youth are more likely to be transferred to adult facilities. The disparities grow at almost every step. The Relative Rate Index (RRI) is a measure of the rate of racial disparity between white youth and youth of color at a particular stage in the system.9)OJJDP (2014). What is an RRI? Data are available for African-American youth; for American Indians or Alaskan Natives (AIAN) youth; for Asian, Hawaiian, or Pacific Islander (AHPI) youth; and for minorities, defined as African-Americans, AIAN, and AHPI together. There are no RRI data on Latinos’ contact with the juvenile justice system. Thus, because “minority” RRI does not encompass ethnicities, this paper generally considers RRI data that compare treatment of white youth to that of African-American youth. States are required to submit analyses to OJJDP when their RRI exceeds 1.0 for any of the racial minorities tracked with RRI. Most commonly, that requirement comes into play for African-American youth; in some states, other minority groups are overrepresented. An RRI of 2.0 among African Americans at the point of arrest means that arrest is twice as common for black youth as for white youth. Because populations and demographics vary widely by state, local jurisdiction, and over time, comparing ratios instead of absolute numbers is essential to understanding DMC. The RRI consistently demonstrates that youth of color are overrepresented at many stages of the juvenile justice system as compared with their presence in the general population. Data show this overrepresentation persists across jurisdictions and time.10)The Burns Institute organizes state-by-state data on DMC with data provided by the OJJDP. County-by-county data. An RRI is not available to compare the treatment of Latino youth with non-Latino youth. Only 29 states have produced data for the nine points of contact. Lastly, while this briefing paper cites nationwide RRI data, policymakers and practitioners need to examine state and county data to better understand the meaning of RRI and the prevalence of DMC in a given jurisdiction. For instance, national data can blur differences between New Jersey and Pennsylvania, and statewide data can blur the differences between Scranton’s Lackawanna County and Philadelphia. As shown in Figure 1, arrest rates for juveniles have dropped by half since peaking in 1996.12)Comprehensive data are available here. While the overall arrest rates for both black youth and white youth have dropped over this time, the relative rate (which compares them) has remained the same. This means that there has not been a sizable impact on DMC despite an impressive drop in youth arrests. Nationally, African-American youth are still twice as likely to be arrested as white youth.13)Puzzanchera, C. and Hockenberry, S. (2013). National Disproportionate Minority Contact Databook. Developed by the National Center for Juvenile Justice for the Office of Juvenile Justice and Delinquency Prevention. Online. Despite a drop in overall arrest rates nationally, black youth are still twice as likely to be arrested as white youth. Are youth of color committing more crime, thus resulting in a higher arrest rate? Comparing arrest rates to self-report data for the most common offenses committed by juveniles, Janet L. Lauritsen concluded that there were few group differences between youth of color and white youth. Differences exist regarding violent crimes, which were more prevalent among African-American and Latino youth.14)Lauritsen, J. L. (2005). Racial and ethnic difference in juvenile offending. In Hawkins, D. F. & Kempf-Leonard, K. (Eds. ), Our children, their children: Confronting racial and ethnic differences in American juvenile justice (pp. 83-104). Chicago: University of Chicago Press. However, youth arrests for the most violent crimes are rare, accounting for roughly 5 percent of all juveniles’ arrests.15)Campaign for Youth Justice (Undated). Most Youth in the Adult System Are Convicted of Minor Crimes. Far more common reasons for arrest are non-violent, low-level or even non-criminal acts.16)Puzzanchera, C. (2013). Juvenile Arrests 2011. Washington, DC: OJJDP. Arrests for property crimes – burglary, larceny-theft, motor vehicle theft, and arson – comprise one in four arrests of juveniles. Note: The RRI has been consistently at or near 2.0 for all reported years. This means that black juveniles are twice as likely to be arrested as white juveniles. This ratio has persisted as overall juvenile arrest rates have fallen. Status offenses are a category of behaviors that are illegal based solely on the age of the offender. The FBI Uniform Crime Reporting (UCR) Program currently collects data on arrests for two status offenses: curfew violations (including loitering) and liquor law violations.17)The Uniform Crime Reports stopped tracking arrests for running away in 2010. There were 93,400 juveniles arrested for running away in 2009, a 34 percent decline from 2000. Truancy is the most common status offense, but the UCR does not state its prevalence. As with overall arrest rates, the arrest rates for status offenses have declined. Liquor law violation arrests have declined 37 percent since 2006 and curfew violation arrests have declined 50 percent.18)OJJDP (2014). OJJDP Statistical Briefing Book. Online. In 2011, black youth were 269 percent more likely to be arrested for violating curfew laws than white youth. Despite these promising declines, gaps remain. In 2011, African American youth were 269 percent more likely to be arrested for violating curfew laws than white juveniles were (see Figure 2). Unless one believes teenagers’ desire to stay out past curfew changes year to year, the fluctuations in arrest rates for black and white youth alike strongly suggest that policy changes, not actual behaviors, are driving the gaps. Note: RRI calculated by author. Because they are low-level offenses, status offense arrests are not typically handled in court, but they occasionally are. In 2010, courts handled 137,000 cases in which the highest offense was a status offense – a 29 percent decline from 2001.19)Puzzanchera, C., & Hockenberry, S. (2013). Juvenile Court Statistics, 2010. Washington, DC: National Center for Juvenile Justice. More than a third of the 88,000 liquor law arrests were petitioned in 2010, as were 20 percent of that year’s 77,000 curfew violations. Occasionally, status offenders are even detained, despite the fact that they do not pose a threat to their communities. A one-day count of detained and committed juveniles, taken in 2011, found more than 2,000 juveniles – half of them white, one-third of them black – whose most serious offense was a status offense.20)Sickmund, M., Sladky, T. J., Kang, W., & Puzzanchera, C. (2013). Easy Access to the Census of Juveniles in Residential Placement. There are a plethora of explanations for why youth of color are arrested more frequently for the same behaviors than their white counterparts, some of which derive from geographic patterns of segregation. Curfew laws are more common in cities than in suburbs. Given the realities of residential patterns by race, these differences may be reflected in higher arrest rates of minority youth than white youth for some offenses. As a result, juveniles behaving in the same way – for example, hanging out late at night – will be treated differently based on where they live, not on how they behave. Property crimes are the most common offenses for which juveniles are arrested, including larceny (76 percent of property crimes), burglary (18 percent), motor vehicle theft (4 percent), and arson (1 percent). As shown in Figure 3, arrest rates for black juveniles have consistently been double that for white juveniles. This ratio held steady from the mid-1990s through the middle of the 2000s. However, in recent years, the ratio increased. In 2011, black juveniles were more than two-and-a-half times as likely to be arrested for property crimes as whites. In 2011, black youth were more than 2.5 times as likely as white youth to be arrested for a property offense. Note: Official RRI rata are published for 1990-2010. Other years calculated by author. Some of the most substantial disparities are found in arrest rates for drug offenses (See Figure 4) despite little evidence that drug use is more prevalent for different races. The Centers for Disease Control and Prevention’s 2011 Youth Risk Behavior Survey (YRBS) found 23 percent of all high school students report using marijuana in the past 30 days, including 25 percent of black students and 22 percent of white students. Thirty-two percent of high school students reported that they were offered, sold, or given an illegal drug by someone on school property in the past 12 months, including 33 percent for black and white students alike.21)Centers for Disease Control and Prevention (2012). 1991-2011 High School Youth Risk Behavior Survey Data. However, geographic segregation probably plays a role among many other factors. Suburban youth who use or sell drugs are more likely to do so within their homes, while urban youth are more likely to use or sell in public spaces, where they are likely to be seen and be caught.22)Armour, J., & Hammond S. (2009). Minority youth in juvenile justice system: Disproportionate minority contact. Washington, DC: National Conference of State Legislatures, p. 4. At the beginning of the 1980s, black and white youth were arrested at roughly equivalent rates, approximately one in 300. The War on Drugs changed that. Through the 1980s, the arrest rate for black youth increased more than 350 percent even as the arrest rate for white juveniles declined. By 1991, a black juvenile was 579 percent more likely to be arrested for a drug offense than a white teenager. Figure 4 also demonstrates the limitations of DMC data as a lens to define success. Policymakers and practitioners should look at both relative and individual rates. RRI for drug arrests halved from 5.8 in 1991 to 2.9 in 1995; that drop was driven by increases in arrests for white juveniles that outpaced the increase of arrests of black juveniles. Since 1996, a 60 percent drop in black juveniles’ arrests for drug offenses gradually reduced the RRI. Comparing YRBS data for 1997 and 2011 shows a decline in drug use, but not on a scale that aligns with the decline in arrest rates. For example, in 1997, 26 percent of high school students reported using marijuana in the past 30 days versus 23 percent in 2011.23)Centers for Disease Control and Prevention (2012). 1991-2011 High School Youth Risk Behavior Survey Data. Law enforcement choices warrant further study. 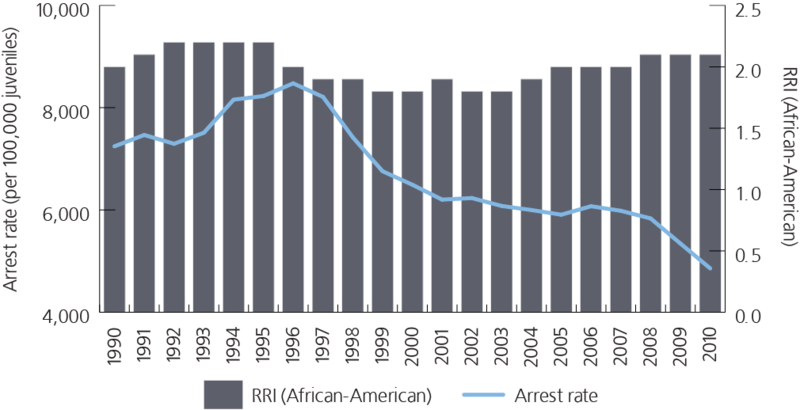 Since the late nineties, drug arrest rates for black juveniles have declined, tempering the RRI for drug arrests. As of 2011, black juveniles were still 44 percent more likely to be arrested for drug offenses than were white juveniles. While there is a troubling amount of real violence among some juveniles, police presence in schools has led to the criminalization of ordinary adolescent misbehavior. The presence of school resource officers can make a schoolyard fight into a simple assault; playing catch with a teacher’s hat becomes robbery.24)Henning, K. N. (2012). Criminalizing Normal Adolescent Behavior in Communities of Color: The Role of Prosecutors in Juvenile Justice Reform. Cornell Law Review, Vol. 98, pp. 383-462, 2013; Georgetown Public Law Research Paper No. 12-117. Numerous empirical studies document this. A 2000 study found sharp racial disparities in the criminalization of misbehavior; black students in the study “appear[ed] to be referred to the office for infractions that are both less serious and more subjective in their interpretation than white students.”25)Skiba, Russell J., et. al. (2000). Ind. Educ. Policy Ctr., The Color of Discipline: Sources of Racial and Gender Disproportionality in School Punishment, cited in Thurau, L. & Wald, J. Controlling Partners: When Law Enforcement Meets Discipline in Public Schools. New York Law School Law Review, Vol. 54, No. 4. (2009-2010), p. 981. In recognition of the problem, the Departments of Justice and Education jointly released guidance to school districts in 2014 describing how to administer school discipline practices without discriminating on the basis of race, color, or national origin.26)The resource documents are available here. According to data from the Department of Education’s Office for Civil Rights, the discrepancies that appear throughout the juvenile justice system are also prevalent at school. Black students are 16 percent of all public school students and 31 percent of all arrests. As with overall arrest rates, the interaction of student behavior and school policies is at the root of these differences. Some school personnel lack the cultural competency to deal with misbehaviors on campus, and schools often lack the resources to address misbehavior outside the justice system. Sadly, the problem begins early. Black children make up 18 percent of preschool enrollment and 48 percent of suspended preschoolers.27)U.S. Department of Education Office of Civil Rights (2014). Civil Rights Data Collection. Issue Brief No. 1. Black students make up 16 percent of all public school students and 31 percent of all arrests. Federal agencies designed to aid youth sometimes work at cross-purposes to the disadvantage of youth of color. Although strong partnerships between the Department of Education and the Department of Justice strive to eliminate racial disparities in school discipline policies and practices, the Department of Justice’s Community Oriented Policing (COPS) program recently received large increases in funds despite growing awareness that increases in police presence are associated with worse outcomes for youth of color.28)Na, C. & Gottfredson, D. C. (2011). Police Officers in Schools: Effects on School Crime and the Processing of Offending Behaviors, Justice Quarterly. Using typical misbehavior as a gateway into the juvenile justice system is also done via valid court orders. The valid court order (VCO) amendment, part of 1980 amendments to the JJDPA, allowed secure detention of status offenders who violated a judicial order by the juvenile court. A student who is frequently truant from school may be ordered by a judge to attend school, but if truancy continues for this student, it can lead to detention; the teenager is now in violation of a valid court order. The student may fail a drug test, thus violating the court order. How often this occurs is hard to determine, but the Texas Public Policy Foundation found that for 2007 VCO violations led as many as 12,000 juveniles into secure detention pursuant to a status offense; that number had declined by a third by 2011.29)Marc Levin, M. & Cohen, D. (2014). Kids Doing Time for What’s Not a Crime: The Over-Incarceration of Status Offenders. Austin, Texas: Texas Public Policy Foundation. For drug offenses, enhanced penalties for conduct within a set distance of a school, park, or public housing system are more likely than similar conduct in other locations. These penalties come into force more frequently in densely packed urban areas than in suburban ones.30)Thompson, C. (2014). What happens when an entire city becomes a drug-free zone. Washington, DC: ThinkProgress. As such, segregated housing patterns can impact DMC. The OJJDP’s one-day census of confined juveniles finds sharp disparities among white, black, and Latino juveniles (See Table 1). Unlike RRI, the one-day census does categorize by ethnicity (for Latinos). Population31)2012, ALL CHILDREN AND ADOLESCENTS, AGED 0-17. Note that the population statistics are for all children under 18, whereas the column for ‘Secure Detention’ refers to juveniles, aged 10 to 17. Secure Placement32)Sickmund, M., Sladky, T. J., Kang, W., & Puzzanchera, C. (2013). Easy Access to the Census of Juveniles in Residential Placement. Data on totals (as opposed to rates) demonstrate the cumulative impact of DMC at each stage of the process. While non-Hispanic whites comprise 53 percent of the juvenile population, they comprise 33 percent of incarcerated youth. Black youth are 14 percent of all youth, but 40 percent of incarcerated youth. Hispanic youth are 24 percent of all youth and 23 percent of incarcerated youth. National-level RRI data show that African American youth are detained at rates 1.4 times that of their white counterparts. These detention rates already encompass differences in arrest rates. Thus the RRI of 1.4 means that for black juveniles, more than 25 out of 100 cases referred to juvenile courts were detained. For white juveniles, that rate was under 19 out of 100. National-level RRI data show that African American youth are placed out-of-home at rates 1.2 times that of their white counterparts. RRI data for placement already encompass differences in the rates at which their cases are referred to juvenile courts. Thus the RRI of 1.2 means that for black juveniles, nearly 30 out of 100 cases referred to juvenile courts were detained. For white juveniles, that rate was under 25 out of 100. Though each stage of the justice process can hamper youth development, it is secure placement that is most significant for the prospects for the rest of a young person’s life. An adolescent who has spent time in secure detention is far less likely to attain a high school diploma or consistently participate in the labor force in the future.33)Keeley, J. H. (2006). Will Adjudicated Youth Return to School After Residential Placement? Results of a Predictive Variable Study. Journal of Correctional Education 57, 65-85; Hjalmarsson, Randi. (2008). Criminal Justice Involvement and High School Completion. Journal of Urban Economics, 63: 613-630; Cameron, S. V., & Heckman, J. J. (1993). The Nonequivalence of High School Equivalents. Journal of Labor Economics 11: 1-47. (Two-thirds of juveniles are committed for nonviolent offenses (mostly property crimes, public order offenses, status offenses, and technical violations),34)Sickmund, M., Sladky, T. J., Kang, W., & Puzzanchera, C. (2013). Easy Access to the Census of Juveniles in Residential Placement. leading many to question the value of secure confinement for so many youth. Holman and Ziedenberg35)Holman, B., & Ziedenberg, J. (2006) The Dangers of Detention: The Impact of Incarcerating Youth in Detention and Other Secure Facilities. looked comprehensively at the impact of secure placement on youth, finding that it is more likely that detained youth will continue to engage in delinquent behavior upon release. The authors also found a “…profoundly negative impact on young people’s mental and physical health and physical well-being, their education, and their employment.” As such, unequal treatment in secure placement is the most troubling because the impact of that unequal treatment is most severe. There are examples of jurisdictions that have successfully addressed DMC. Among juveniles, California’s Ventura County is 47 percent Latino and 43 percent white. Data reveal ethnic disparities throughout its juvenile justice system. While there are roughly as many Latino youth as white youth, Ventura County arrested two-and-a-half times as many Latino youth as white youth in 2011.36)Data courtesy of the Burns Institute. Calculations are the author’s. The County contracted with the W. Haywood Burns Institute to address two points of disparity: ensuring that youth appeared in court and reducing the attendant detentions from bench warrants for failure to appear. Subsequently, Latino admissions for probation violations fell 50 percent.37)Burns Institute (2014). Annie E. Casey Foundation Highlights Our Use of Data In Attacking Racial & Ethnic Disparities. The JJDPA, enacted in 1974, is long overdue for reauthorization. As noted above, prior amendments have highlighted the racial disparities that plague juvenile justice, first at confinement and then at other points of contact. To be eligible for funding under the JJDPA, the law requires states to “address” DMC, though there is no guidance as to what exactly that means, and regulations have not been issued to specify this mandate. A strengthened JJDPA would require states to report the steps they have taken to reduce DMC at each point of contact with the system. Some jurisdictions have, indeed, made progress on this. Publicly report findings and progress in efforts to reduce disparities on an annual basis. That ample racial juvenile justice data exist is a promising and necessary first step toward remedying the disparities. The multiple points of contact measured by RRI allow jurisdictions to review their treatment of minority youth vis-à-vis white youth at each stage and take steps to eliminate both overt racial bias and unintentional racial bias in the process. The disproportionate criminalization of common misbehavior for adolescents, combined with differential enforcement of illegal behaviors (such as discussed in regard to status offenses and drug crimes) has led to sharply different arrest rates that do not correlate with differences in self-reported behavior between white and black adolescents. Those differences highlight the need to de-criminalize status offenses and eliminate the use of valid court orders that derive from non-criminal behaviors. The negative outcomes that follow arrest and detention show that arresting youth for being youth — and acting youthfully — is counterproductive. Urban jurisdictions need to measure whether enforcing drug laws differently than is done in the suburbs has had any measurable impact on drug use. For states and localities, inclusion of racial impact statements is a pro-active way to address DMC. Much like an environmental impact statement can alert a zoning board to a threat to clean drinking water, a racial impact statement – studying how enforcement of a new law will impact various communities – can alert legislatures to how criminal justice bills may have a disproportionate impact and, if necessary, to seek a more just alternative. Lastly, policymakers need to change their perspective on the best ways to reduce juvenile delinquency while providing meaningful alternatives for arrested juveniles. Low-level offenses can often be better dealt with through non-justice systems such as mental health and behavioral health systems. 1. ↑ Coalition for Juvenile Justice (1988). A Delicate Balance. Washington, DC: Coalition for Juvenile Justice. 2. ↑ Coleman, A. A Disproportionate Minority Contact (DMC) Chronology: 1988 to Date, Washington, DC: Office of Juvenile Justice and Delinquency Prevention. 3. ↑ Coalition for Juvenile Justice (2010). Disproportionate Minority Contact (DMC) Facts and Resources. 4. ↑ Pope, C., Lovell, R., & Hsia, H. (2002). Disproportionate Minority Confinement: A Review of the Literature from 1989 through 2001. Washington, DC: Office of Juvenile Justice and Delinquency Prevention. 5. ↑ Nellis, A. (2011). Policies and Practices That Contribute to Racial and Ethnic Disparity in Juvenile Justice, published in Parsons-Pollard, N. Y. (2011). Disproportionate Minority Contact: Current Issues and Policies. Durham, NC: Carolina Academic Press, pp. 3-4. 6, 11. ↑ OJJDP (2012). In Focus: Disproportionate Minority Contact, Washington, DC: Office of Juvenile Justice and Delinquency Prevention. 7, 13. ↑ Puzzanchera, C. and Hockenberry, S. (2013). National Disproportionate Minority Contact Databook. Developed by the National Center for Juvenile Justice for the Office of Juvenile Justice and Delinquency Prevention. Online. 8, 16. ↑ Puzzanchera, C. (2013). Juvenile Arrests 2011. Washington, DC: OJJDP. 9. ↑ OJJDP (2014). What is an RRI? 10. ↑ The Burns Institute organizes state-by-state data on DMC with data provided by the OJJDP. County-by-county data. 12. ↑ Comprehensive data are available here. 14. ↑ Lauritsen, J. L. (2005). Racial and ethnic difference in juvenile offending. In Hawkins, D. F. & Kempf-Leonard, K. (Eds. ), Our children, their children: Confronting racial and ethnic differences in American juvenile justice (pp. 83-104). Chicago: University of Chicago Press. 15. ↑ Campaign for Youth Justice (Undated). Most Youth in the Adult System Are Convicted of Minor Crimes. 17. ↑ The Uniform Crime Reports stopped tracking arrests for running away in 2010. There were 93,400 juveniles arrested for running away in 2009, a 34 percent decline from 2000. 18. ↑ OJJDP (2014). OJJDP Statistical Briefing Book. Online. 19. ↑ Puzzanchera, C., & Hockenberry, S. (2013). Juvenile Court Statistics, 2010. Washington, DC: National Center for Juvenile Justice. 20, 32, 34. ↑ Sickmund, M., Sladky, T. J., Kang, W., & Puzzanchera, C. (2013). Easy Access to the Census of Juveniles in Residential Placement. 21, 23. ↑ Centers for Disease Control and Prevention (2012). 1991-2011 High School Youth Risk Behavior Survey Data. 22. ↑ Armour, J., & Hammond S. (2009). Minority youth in juvenile justice system: Disproportionate minority contact. Washington, DC: National Conference of State Legislatures, p. 4. 24. ↑ Henning, K. N. (2012). Criminalizing Normal Adolescent Behavior in Communities of Color: The Role of Prosecutors in Juvenile Justice Reform. Cornell Law Review, Vol. 98, pp. 383-462, 2013; Georgetown Public Law Research Paper No. 12-117. 25. ↑ Skiba, Russell J., et. al. (2000). Ind. Educ. Policy Ctr., The Color of Discipline: Sources of Racial and Gender Disproportionality in School Punishment, cited in Thurau, L. & Wald, J. Controlling Partners: When Law Enforcement Meets Discipline in Public Schools. New York Law School Law Review, Vol. 54, No. 4. (2009-2010), p. 981. 26. ↑ The resource documents are available here. 27. ↑ U.S. Department of Education Office of Civil Rights (2014). Civil Rights Data Collection. Issue Brief No. 1. 28. ↑ Na, C. & Gottfredson, D. C. (2011). Police Officers in Schools: Effects on School Crime and the Processing of Offending Behaviors, Justice Quarterly. 29. ↑ Marc Levin, M. & Cohen, D. (2014). Kids Doing Time for What’s Not a Crime: The Over-Incarceration of Status Offenders. Austin, Texas: Texas Public Policy Foundation. 30. ↑ Thompson, C. (2014). What happens when an entire city becomes a drug-free zone. Washington, DC: ThinkProgress. 31. ↑ 2012, ALL CHILDREN AND ADOLESCENTS, AGED 0-17. Note that the population statistics are for all children under 18, whereas the column for ‘Secure Detention’ refers to juveniles, aged 10 to 17. 33. ↑ Keeley, J. H. (2006). Will Adjudicated Youth Return to School After Residential Placement? Results of a Predictive Variable Study. Journal of Correctional Education 57, 65-85; Hjalmarsson, Randi. (2008). Criminal Justice Involvement and High School Completion. Journal of Urban Economics, 63: 613-630; Cameron, S. V., & Heckman, J. J. (1993). The Nonequivalence of High School Equivalents. Journal of Labor Economics 11: 1-47. 35. ↑ Holman, B., & Ziedenberg, J. (2006) The Dangers of Detention: The Impact of Incarcerating Youth in Detention and Other Secure Facilities. 36. ↑ Data courtesy of the Burns Institute. Calculations are the author’s. 37. ↑ Burns Institute (2014). Annie E. Casey Foundation Highlights Our Use of Data In Attacking Racial & Ethnic Disparities.